Where did the construction materials go? A year after Operation Protective Edge, the reconstruction from the ground up of the first totally destroyed home, of thousands like it, just began. What took so long? 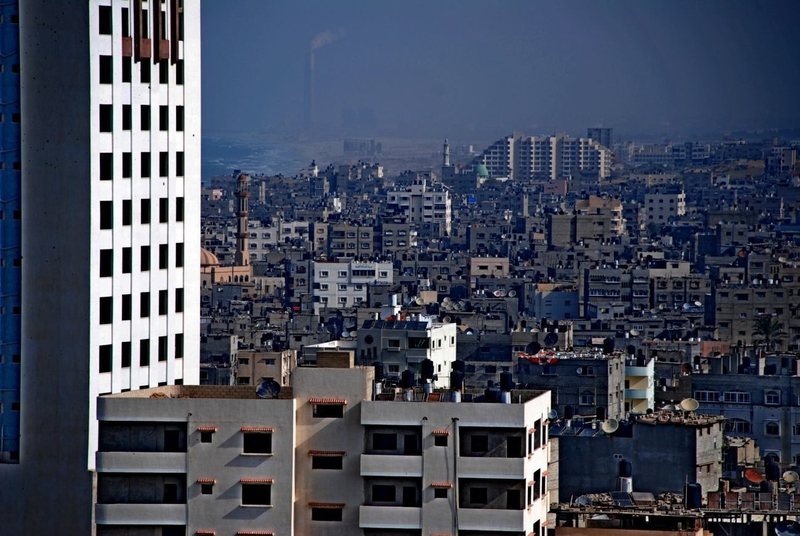 On June 24, 2015, Palestinian Housing Minster, Mufid Al-Husayneh, announced the beginning of a new phase in Gaza’s reconstruction – the rebuilding of homes destroyed during Operation Protective Edge. Ten months after the fighting ended, despite massive destruction and international mobilization, Gaza took its first step toward rebuilding the first out of thousands of homes that were completely destroyed. What took so long? 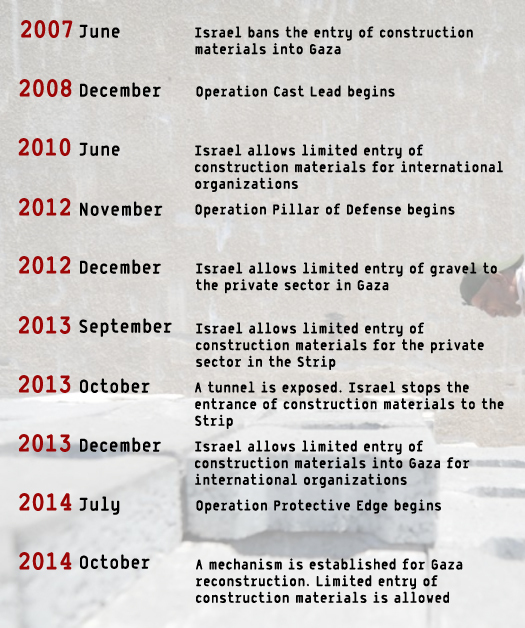 Prior to Operation Protective Edge, Israel imposed severe restrictions on the sale of construction materials to Gaza, arguing that these were “dual use” materials, meaning that they could be used for both civilian and military purposes (see box on chronology of restrictions). The main argument was that Hamas might use construction materials purchased in Israel to build bunkers and since late 2013, that materials could be used to build tunnels for the purpose of launching attacks on Israeli territory. Gisha has and continues to object to the definition of a basic civilian commodity such as construction materials as “dual use”, thus paving the way for blanket bans, especially when considering the fact that the ban has not proven effective in preventing tunnel building. The restrictions, coupled with the closure of most smuggling tunnels out of Egypt, did play a role in the unemployment rate in Gaza’s spiking from 27.9% in the second quarter of 2013 to 40.8% in the first quarter of 2014. The construction sector, which contributed 17% of Gaza’s GDP in the second half of 2013, before the closure of the Gaza-Egypt tunnels, and provided jobs to more than 24,000 individuals in mid-2013, has since collapsed almost completely. True to the second quarter of 2015, only 4.2% of employed workers in Gaza, or about 11,000 people, are employed in the construction sector. The unemployment rate currently stands at 41.5%. After Operation Protective Edge, and in keeping with the consensus about the need for swift reconstruction in the Strip, Israel’s security establishment announced Israel would now allow construction materials to enter Gaza for the private sector for the purpose of reconstruction. Former IDF Chief of Staff Benny Gantz, among others, expressed the need for a new approach in Gaza when he said that the balance must tilt towards hope rather than despair. Otherwise, said Gantz, the fighting might resume. Moreover, while expressing support for reconstruction, military officials admitted that Hamas would be able to build tunnels even without concrete (Hebrew) if they wanted to. Given Israel’s concern over the possible use of construction materials for building tunnels, the Gaza Reconstruction Mechanism, or GRM, was created. The terms of GRM were agreed upon by Israel and the Palestinian Authority, with the United Nations implementing and supervising the mechanism. It purportedly enables Israel to monitor how construction materials entering Gaza are being used. Under the GRM, Gaza suppliers and contractors must demonstrate that they are adequately securing warehouses where construction materials are stored. The GRM also allows Israel to pre-approve those involved at every stage of construction, including determining individuals’ eligibility to buy construction materials through the mechanism and thus repair and re-build homes as well as other private sector initiatives. It is inevitable that a complicated mechanism such as the GRM will slow down reconstruction efforts and increase costs. The question is what purpose it serves, if any. Last summer, more than 19,000 housing units were either completely destroyed or rendered inhabitable. An additional 113,000 were damaged. Despite immense need, the reconstruction of homes, as opposed to just minor repairs, has begun only recently. It was preceded by disputes between Israel and the Palestinian Authority over the formula for calculating the amount of materials needed for every square meter of construction. It was only in late June, about ten months after the cease-fire entered into effect, that a compromise was reached and a formula agreed upon. This is not the first time that Israel has sought to employ a mathematical formula to calculate what is needed for basic civilian life in Gaza. Previous formulas, featured in what is known as the Red Lines document, rationed the minimum number of calories Gaza residents needed to survive, and were, rightly, a source of shame for the Government of Israel when Gisha exposed them. In contrast to the “Red Lines” formula, this time, a security rationale has ostensibly been articulated. It is meant to prevent construction materials from being used for building tunnels, but it turns out that the controlled shortage created by the formula is one of the causes for the emergence of a black market for construction materials, as the army itself admits. Col. Grisha Yakubovich, head of COGAT’s Civil Department told (Hebrew) Israeli TV news: “Because of the situation in Gaza, the same people who are found eligible to receive construction materials prefer to sell them in the black market, and now there is, unfortunately, a black market in the Gaza Strip, and all the people who aren’t supposed to buy, do so from the black market”. Between the end of Operation Protective Edge and the end of July, 2015, Israel allowed about 1.47 million tons of construction materials into Gaza via Kerem Shalom Crossing. Only about 22% of them were intended for the repair of homes that were damaged during the fighting. The rest were intended for international aid agency projects. About half of the materials were used for projects funded by Qatar, which started before the fighting even began. Going by the agreed formula for calculating the amount of construction materials required for every square meter of construction, only 6.5% of the construction materials needed in Gaza have been brought in between the cease-fire and the end of July. 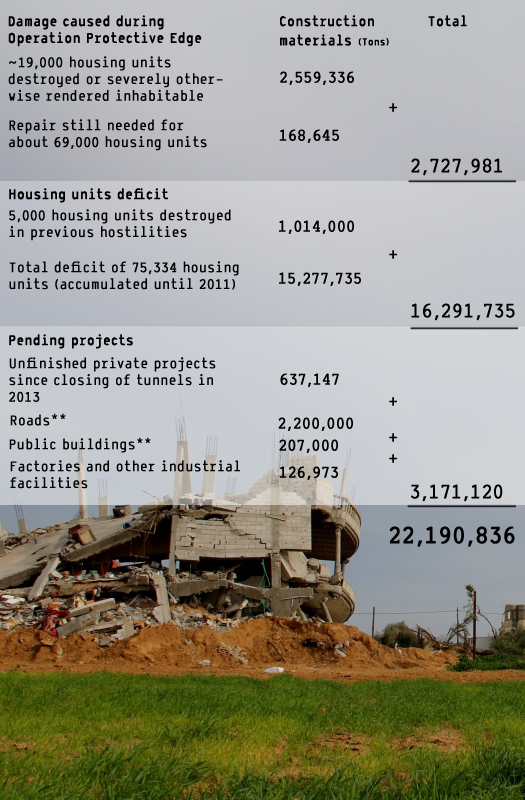 Gaza needs about 22 million tons of construction materials, including for housing units destroyed during Operation Protective Edge and previous military operations, as well as for accumulated need for housing units in Gaza, damaged infrastructure, public buildings and private businesses (see box for Gisha’s approximate calculations). All construction companies, contractors, suppliers, cement mixing plants and cinder block manufacturers wishing to take part in the reconstruction and rebuilding process must be cleared by Israel. The suppliers and the companies that store construction materials have to employ security guards and use security cameras around the clock to allow supervision of the construction materials. Construction on destroyed home began about a month and a half ago. The families who want to rebuild submit their documents to the Palestinian Housing Ministry, which transfers them to the Palestinian Civil Affairs Committee and from there, the list is transferred to Israel for approval. A contractor whose building project in Gaza was approved by Israel told Gisha that he had to provide Israel with the location of the building, the building owner’s ID card, the building plans and the amount of construction materials required. The contractor said it took four months for the project to be approved, and he decided to invest elsewhere in the meantime. Another contractor told Gisha that each of the elements involved in the project requires Israeli approval. “The process is very complicated”, he said, “You need warehouses and supervision. These days everything is restricted and not all the companies received Israel’s approval to work. If a project like this used to take me three or four months, now it would take about seven months, and so I have to keep workers on for longer and spend more money than I would have before on a similar project”. A man who owns a construction company told Gisha that the current system often makes construction economically unsound. “As a businessman, I wouldn’t want to build now”, the man told Gisha, “To build I’d need to hire people and sign contracts with workers and with other companies. It’s not worth my while because I can’t be sure my project is going to get approved, and until it does, I lose money because I have to pay the workers I signed on. If the project does get approved and then there’s a cement shortage, I also lose. So then the question is if the construction materials approved for the project enter quickly or not, whether they come in all at once or in batches, which would force us to wait a long time at every stage of the construction. Cement has to be available on the market for the private sector to start building and working, and for the people who have the money and are not waiting for donations, to be able to build – not just the people whose homes were destroyed, but anyone who wants to build additions to their house, add another story, or build a home to get married”. The main actors that are currently able to build in Gaza are international agencies and the Qatari Committee, which have the resources to navigate the bureaucratic process and are advancing projects that began even before Operation Protective Edge, and the advent of the GRM. For the private sector and individuals in Gaza, who don’t have the resources to navigate the bureaucracy and absorb its extra costs and delays, the GRM seems more hurdle than help. Make no mistake, there are other, significant factors slowing down the reconstruction effort as well. Complex planning for fully destroyed neighborhoods requires coordination between different and sometimes feuding authorities, as well as input by engineers and other experts. Severe funding shortages continue, including pledges by donor countries during the October 2014 Cairo conference that have not come in due to pre-conditions that have not materialized, such as the return of the Palestinian Authority to Gaza. 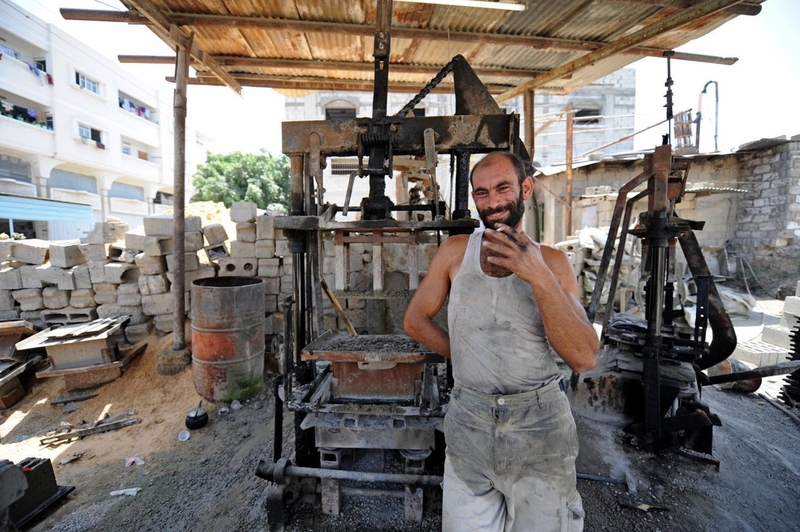 These factors compound the fact, that in Gaza’s struggling economy, ordinary people are unable to afford the materials or the labor to rebuild their businesses and homes, absent other external sources of funding, compensation or charity. While the new phase of the rebuilding may have ostensibly begun, we also heard many complain that they don’t understand how to approach the mechanism, who is eligible to purchase materials and according to which conditions. Given that the mechanism is meant to help a substantial number of people who need to rebuild and repair their homes, not to mention build in Gaza in general, lack of clarity about how it works is a major liability. Nonetheless, people who spoke to us who were involved in the process of establishing the mechanism and are party to it are satisfied with the outcome so far. They point to the fact that large amounts of information have been processed by the mechanism and that all the data is available online; that tens of thousands of residents whose homes were damaged have received materials to undertake repairs, and; importantly, that over a million tons of construction materials having entered Gaza. They say that without the mechanism, it’s possible that Israel would have never lifted the sweeping ban on the sale of construction materials in Gaza at all. Notwithstanding, they agree that progress has been slow and macroeconomic indicators prove this. Needs in Gaza didn’t start with this most recent operation or even those that preceded it. “Some people, especially those who lost their homes, they don’t have money to rebuild, so they are waiting for financing. But there are also many who have money and can build, but their homes were not damaged in the war, so they have not appeared on the lists. These people cannot build”, said an owner of a construction company and cement mixing plant. “For many years there were no construction materials on the market. During these years, the need to build increased due to natural population growth. I myself wanted to build another house for my children who grew up. I am the owner of a construction company and a cement mixing plant, and yet I had no way to build!”. The parties concerned profess a lot of goodwill in having created the GRM. Israel’s senior security officials have repeatedly claimed that allowing Gaza’s reconstruction is more than just a humanitarian gesture; in fact, that it is in Israel’s interest from a security perspective. Several have cited the role access restrictions in general played in the escalation before the summer of 2014. The GRM sought to achieve a balance between the urgent, vital need for reconstruction in Gaza and the drive to prevent construction materials from reaching hostile entities there. What it mostly achieved was to prove, once again, to what extent Israel exercises control over civilian life in Gaza, while largely disavowing responsibility – this combination harming a beleaguered population. One year after Operation Protective Edge, it seems it’s time to put the GRM to rest. Not only has it slowed down reconstruction and made it more expensive in a context short on resources, even the military has admitted that despite the GRM, construction materials are sold on the black market and there is evidence of new tunnels being built. Real solutions to combat the threat of attacks launched from tunnels are in order and essential. 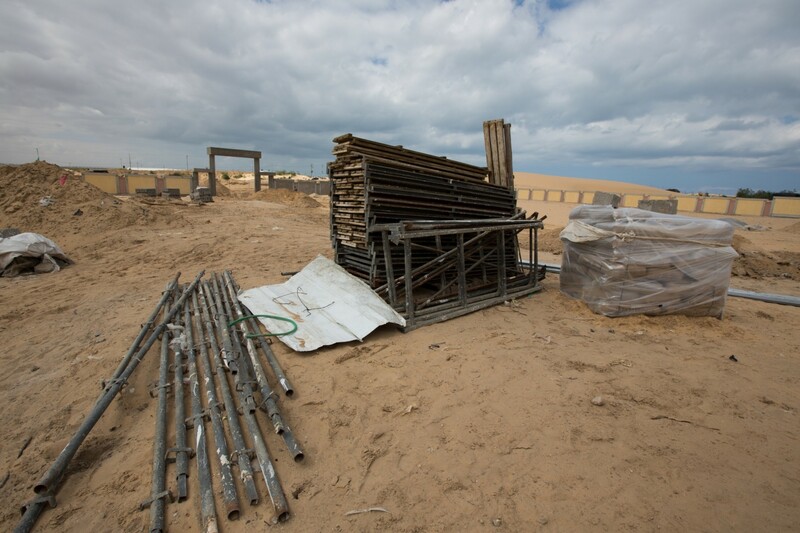 Construction materials are a basic necessity and Gaza’s reconstruction isn’t just about Israel’s security interests. Reconstruction is, quite simply, central to the ability of Gaza residents to lead normal, dignified lives in the Strip, where homes, businesses, public buildings and infrastructure have never been more needed. A year later, the paradigm has to shift and restrictions on the entrance of construction materials, which serve no one, must be removed.